Jared Paventi is the communications director for a disease-related nonprofit in the Northeast. He holds a master's degree from Syracuse University's S.I. Newhouse School of Public Communication and a bachelor's degree from St. Bonaventure University. He also writes a food appreciation blog: Al Dente. Steak tartare is a dish most commonly associated with French cuisine, but according to food historian Arlyn Hackett, its history is much more ambiguous. Mongolian warrior Genghis Khan is credited with inventing the raw beef dish while in the field of battle. Hackett, writing for "The San Diego Union-Tribune," believes that the combination of fresh beef, vinegar, capers, seasoning and raw egg is of German origin. The prospect of eating raw meat and eggs may leave some squeamish, but the dish is renowned as an elegant luxury served in some of the world's finest bistros and restaurants. Take care when enjoying steak tartare and learn about your particular dish before slicing into the first bite. Eat only fresh, ground beef from a trusted butcher. The U.S. Department of Agriculture warns Americans against eating raw meat, as it could carry any number of dangerous bacteria, including E.coli and salmonella. You want to ensure that the beef has been cut in a sterile, cold environment and processed at a slaughterhouse or plant that exceeds federal standards. You may want to find a meat source certified by the Organic Trade Association, an independent organization that advocates for increased standards for meat production. Inform the butcher of your intention to make a steak tartare in order to obtain the highest quality cut. Ensure that the ingredients are fresh. 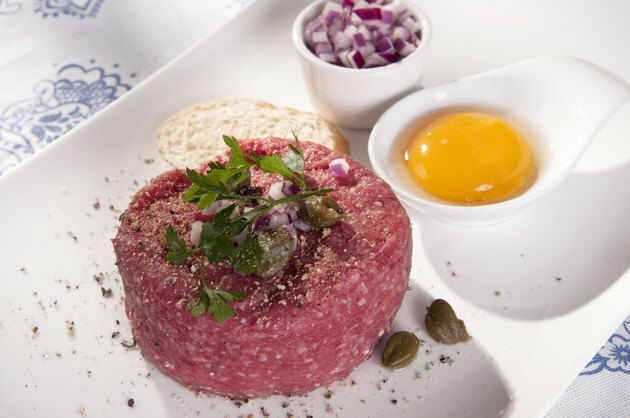 Classic steak tartare is served with a raw egg on top. Like meat, raw eggs are susceptible to carrying salmonella bacteria and should be eaten at your own risk. The U.S. Department of Agriculture cautions against eating raw, unpasteurized eggs, though it reports that pasteurized eggs are safe when raw. Ask about the age of the eggs and whether they have been pasteurized. Ask how the steak is prepared. Cookbook author Dorie Greenspan writes that restaurants in France will often advertise their steak tartare as knife cut. This means that the meat was not processed by machine, reducing the chance for the spread of disease by unclean grinder parts. She writes, "And when you make it at home, you, too, should cut it with a knife, and cut it just before serving." Season the dish however you want. Restaurants often prepare the dish with the classic combination of capers, vinegar, pickles, salt and pepper. That does not mean that you are limited to that combination. Ask your waiter for a side of Dijon mustard, Worcestershire sauce, hot sauce, ketchup, salt and/or pepper. If you are making it at home, Greenspan suggests chopped pickles or sweet relish, anchovies, sun-dried tomatoes or olive oil. Is Ball-Tip Steak Good for Grilling?